There’s something not right about Japanese football fans. It’s like they haven’t got the memo. Don’t they know that football is supposed to be endured? 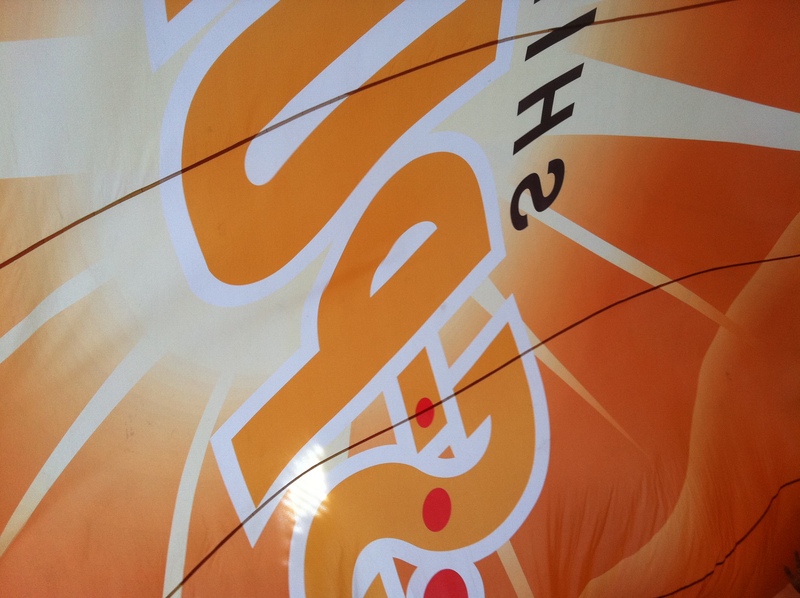 It’s an affliction, an addiction that blights the lives of supporters across the world. I mean, teams are supposed to be owned by morally dubious Russian Oligarchs or Arab Sheiks, not by local companies, local government and certainly not the fans themselves. It’s supposed to be the last bastion of masculinity, not a place where women, children and babies in tiny replica shirts venture or even god forbid participate as fans. You’re supposed to randomly hurl abuse at the referee, a man or woman who has devoted countless hours to the game, who knows the rules inside out and yet still doesn’t know better than you. You are most certainly not to be respectful of them. Then of course there are the songs and chants; these should at least be mildly offensive to the other team and its fans. However, if you can manage to incorporate, racism, sexism or homophobia into them, all the better. They should not include dance routines. But most of all and this really is quite important… you’re not supposed to enjoy the game! Let’s face it, Japan has got fan culture down pat. They are Zen masters in the fanatic arts, fully in tune with Wa, their sense of a communal Japanese identity. Their football is still like all football worldwide, tribal at heart, but this tribe at least is open to most. Even at my hometown club, Huddersfield Town AFC, a club voted Family Club of the year a number of times, I still wouldn’t want to take a young kid all the time. Exposing a kid to the kind of red faced, vein throbbing, eye popping anger and vile language that can come out of some supporters isn’t exactly high on my to do list. I may not blink when I see or hear it but I’ve seen little kids absolutely stunned by it. I can still remember the look on the face of a little four year old girl, just staring, mouth agape as a man nearby turned a bright shade of red as he hurled invective in the direction of the fella with the whistle. 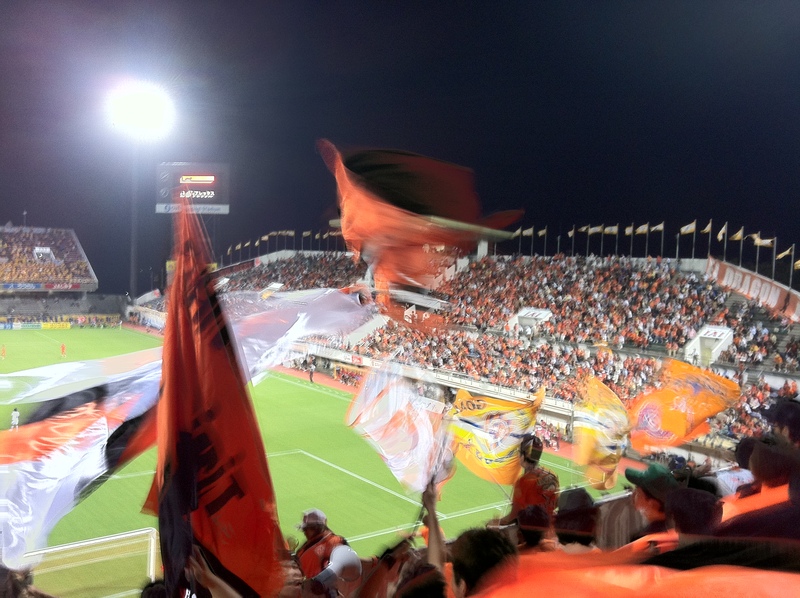 My experience at an Shimizu S-Pulse game was somewhat different. The contrast was in fact pretty stark at times. The S-Pulse fans, all decked out in bright orange replica kits and homemade fan t-shirts, spent almost the whole ninety plus minutes singing their hearts out. Simply put, they were enjoying the sing-along and the football too much to be incensed to such a degree by one decision not going their way on the pitch. On top of that, the friendly, though no less passionate atmosphere was welcoming enough that a girl who couldn’t have been more than ten years old spent the entire match bouncing and cheering away, cajoling her rather less interested older sister to do the same. She must have picked up this habit at a young age, much like the one year old a few seats away who had already mastered the fist pump to, “ore!” Yes, “ore.” The Japanese ‘l’ isn’t ready for a full Spanish “ole!” quite yet. So, what is it about Japanese football that makes it so different from that played on British, European and every other nation’s soil that includes kicking a ball as a national pastime? First of all, age. The J-League has only been in existence since 1992/1993. The historic rivalry of clubs like Liverpool and Manchester Utd in England, Barcelona and Real Madrid in Spain, Inter and A.C. Milan in Italy and Rangers and Celtic in Scotland cannot possible have had time to emerge in such a way here in Japan. In addition, the political, historical and in the case of Rangers and Celtic, religious differences have no equivalents here in Japan. Also, by starting their existence within the last twenty years Japanese clubs benefit from a supporter environment that would not have held the inbuilt sexual and racial biases of those in countries that have played football far longer. There is also the rather complicated fact of culture to contend with. If you ever wonder why Spain plays pretty football while the English hoof it and the Scottish cheer slide tackles like goals, think of the weather. Have you ever tried to play the beautiful game on a rain sodden pitch? Wind blowing too? Not so simple. Ever slide tackled on dry soil? Not so easy. What do fans traditionally value? The British; a player busting a gut, appearing all over the pitch, a one man whirlwind devoted to team play. Italy; catenaccio, otherwise known as the door bolt. The Japanese, a beautiful passing game, but one that rather lacks in a cutting edge as said cutting edge requires a degree of selfishness rather lacking from their sporting mindset. Although perhaps the most telling difference comes with the alcohol. Japanese fans can bring their own. Three hours before kick-off even. In contrast it’s banned in Scottish football stadiums, though not in Rugby ones. The mentality is simply different. Frankly it’s a matter of taste. If you bleed, sweat and cry your team’s colours and so did your father before you and his before him, then it may not be your pint of bitter. But for me? For the kids and families filling the stadium? Passing football, cheap beer, food aplenty, friendly fans and a victory dance called the Roko Roko (the loco loco, again struggling with the ‘l’)? That’ll do us just fine. And with the Nadeshiko Japan (Japan’s women’s team) having brought home the world cup. You have to assume it’s only going to get bigger still.